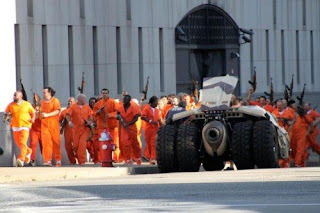 JeremyJahns.com: New Dark Knight Rises pics of Bane and Marion Cotillard! 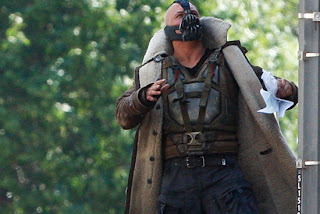 New Dark Knight Rises pics of Bane and Marion Cotillard! 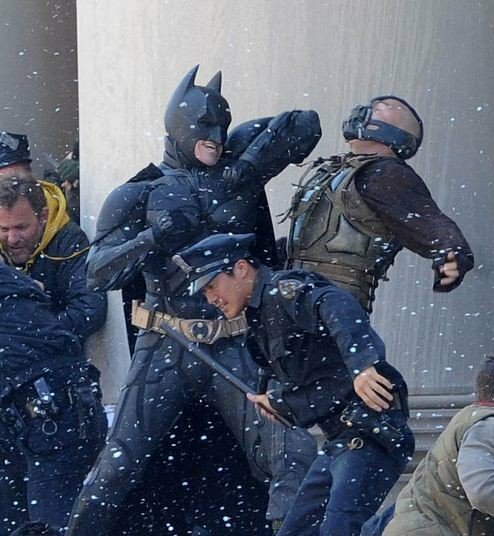 It's almost like the "Powers that Be" know that the fans wanted to see more after that Dark Knight Rises teaser was such a....well....teaser. So we have a few pics of Bane! 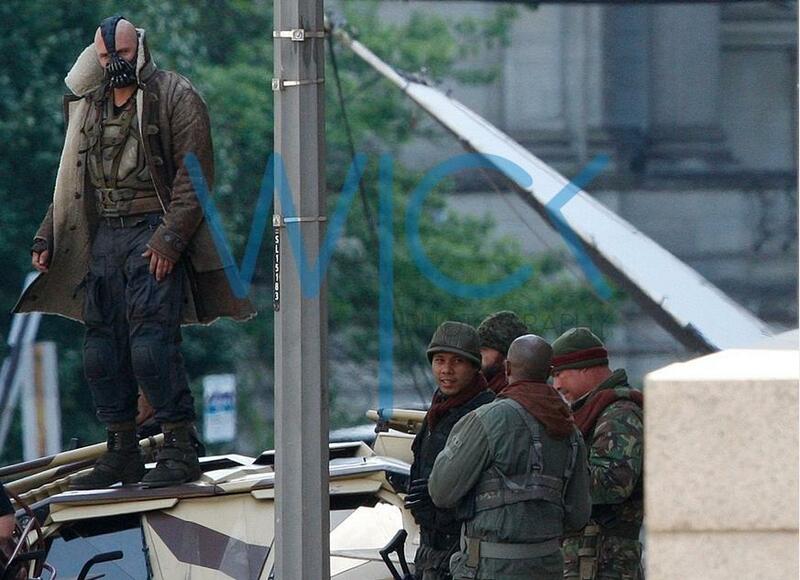 bane fighting Batman, Bane on top of "the tumbler". Bane ripping up a picture of Harvey Dent. It's the most content we've gotten thus far, so click the jump to check it out. WARNING: some of you might consider these pics "Spoilers" but at this point, any and all speculation as to the context of these pics is....well....speculation. My only fear is that Bane is not "Big" enough to call "Bane". I mean, he might be a great villain, but if he doesn't encompass what Ban is, then you might be better off calling him "Bob" or something. But people thought the ame thing when the first pics of the Joker came out, so time will tell. For now, here are the pics. 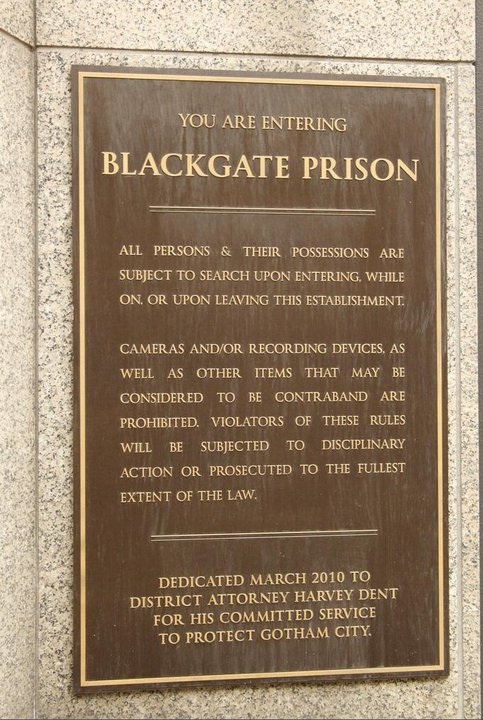 And again, the last 2 (After the Harvey Dent dedication plaque) MIGHT be spoilers...but it's still speculation. Enjoy. 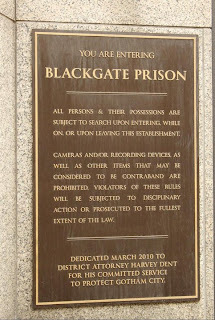 Recognise the mug in that picture? oh yeah....it's Harvey Dent! Dedicated to Harvey Dent. 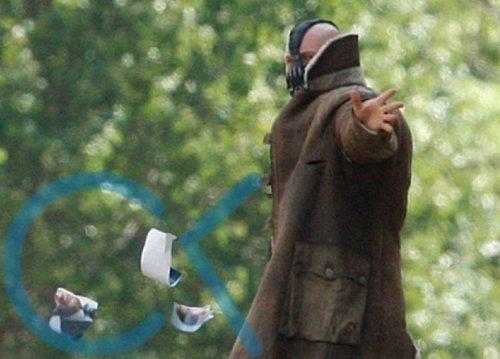 Between Bane ripping up the Harvey Dent picture and this, Do you think Bane is out to expose the truth about Harvey? im so hyped about this movie!!! This is like Inception 2. Well, all the same actors, anyway. 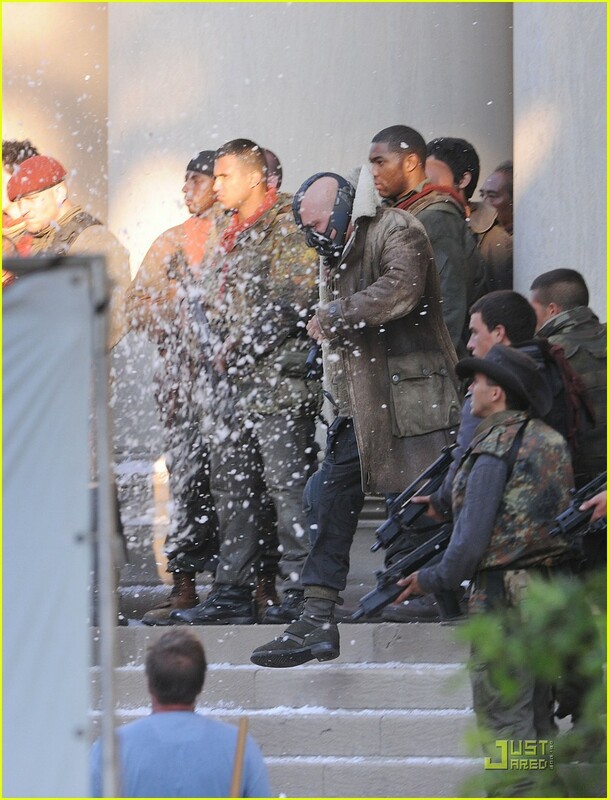 Maybe hes not that big because he's not all bane out(juiced up) and the picture does look like Dent's jaw but maybe it might've been him before hand,we'll have to see if its in the movie when its released;also if Cotillard is Talia i don't think she'll have a long play in the movie. Another couple of pictures (some are the same) where you get a better look at Talia. I like Tommy the size he is. Oh and Jeremy can you please keep in mind that Tommy is human being and not an actual comic book character. You go on and on about how beig he is but he obviously can't make his body as big as Bane is in the comics - and Hardy is already ridiciously buff. He can do push ups on his NECK for f**k sake and I'm not even joking. Go search for a video of him working out. It's so weird. Just to give some info: Bane(venom form) was annouced by Nolan and crew to be a mixture of practical and cgi fx to make him MUCH bigger than he actually appears. Cotillard will be playing duel roles with talia being her primary as well as "bruce's" love interest. While Hathaway will be "batman's" love interest. No official word on if catwoman will already be est(which i'm betting) or brief origin story. Also, Nolan is following his formula with this movie. Batman Begins-"Batman:year one", The Dark Knight-"The Long Halloween"/"The Killing Joke". 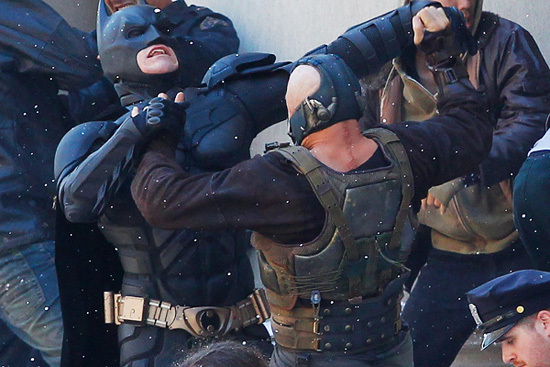 The Dark Knight Rises-"Dark Victory"/"Knightfall". 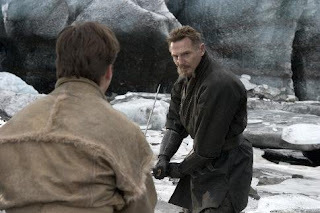 Lastly, Hugo Strange(forget the actor's name)will be a background villain(mainly bane's story), Liam Neison will be back to play Ra's with the antagonist from "Never back Down" playing his younger self(annouced and lazuras pits were shown). And Bruce's/Batman's identity will be reveled by these characters much as it was in the comics first by them(in order: Bane, Hugo, Selena, Talia) Hope this helps everyone and yourself JJ. Keep up the great and funny work. Darth Vaders "Noooooo" in Star Wars Blu-Ray. New Bat-Vehicle Spotted In The Dark Knight Rises? Dark Knight Rises Anne Hathaway as Catwoman Pic!